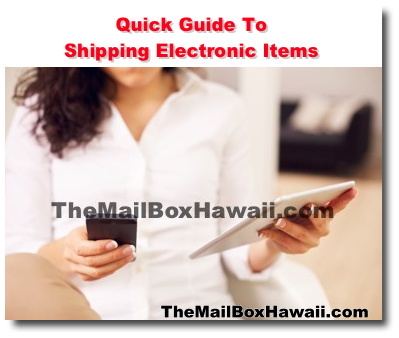 Electronic gadgets, smartphones, tablet computers and their parts have become a common item to ship. Whether you're selling, returning a damaged item or shipping an electronic gift item, follow these simple tips to make sure you package arrived on time and in one piece. 1. Pack smart - When in transit, you don't want your electronic device to shift and risk a fragile part to break off or loosen. Use bubble wrap and wrap your item in several layers so that it is snug in the box. Avoid using paper because it is not a sufficient cushion for your fragile electronic item. 2. Use the "Double Box" technique - With your item packed tightly in the box, find a slightly larger second box to place the first box in. (If your device is still in its original package, and it doesn't feel loose inside when you shake the box, then the retail packaging can serve as your inner box.) Then, fill it with bubble wrap or foam inserts. The layers of padding inside each box help absorb bumps and movement. Avoid using "packing peanuts" since this can create static electricity. Also, make sure you tape the box properly using the H method: seal across the seam of the box and along the edges. 3. Protect your package from heat - Items being shipped via air have a higher risk of getting built-up static electricity. This is dangerous because high static electricity build-up, plus prolonged exposure to heat, your electronic item, particularly lithium battery-powered devices can catch fire or short circuit. So try to separate your devices into as many pieces as possible, placing smaller items into their own bags and wrap larger pieces in bubble wrap. For more tips on packing and shipping items, click here.